Can’t afford a piano but wish your child can learn music, then we suggest to go for the best roll up piano keyboards. As the name suggests, this is a portable piano that’s made from environmentally friendly silicone which comes in a variation of 61 and 81 keys that emit different tones, sounds and rhythms. If you look online, there are many companies offering roll up keyboards with all the features of a real piano. Also additional characteristics like recording music, replaying music, editing tones and transporting any music piece on the computer. Wouldn’t you like to buy one such flexible piano keyboard for yourself? 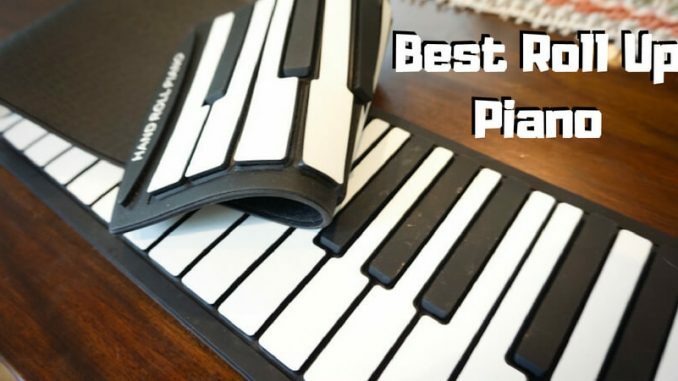 Well, to give you a deeper insight on this product, we have listed down best roll up piano reviews based on their built, features and pricing. Lujex 61 Keys roll up piano is one musical equipment every kid should have. Learn to play different notes and songs with Lujex 61 Keys foldable piano that is manufacture with soft silicone and runs on 4x AA battery and power supply. It also has different demo songs, rhythms and tunes that will keep your kid engaged in their free time. Lujex is offering a 61-key standard roll up piano that has inbuilt 45 demo songs, 128 tones and 128 rhythms. This is an easy piece of musical equipment designed to bring out the musical creativity in a child. The keyboard is made using eco-friendly soft silicone that is comfortable to use, easy to store in small space and light weight to carry around anywhere. One can connect the keyboard to the computer via MIDI cable to play or edit the compositions. Runs on the power supply as well as 4x AA battery. The company doesn’t provide the MIDI cable and 4x AA battery with the product. Learn piano anywhere, anytime with EVERYONE GAIN roll up piano 88 keys keyboard. Easy to use, this portable electric piano is designed for people who want to learn music without spending too much money on musical equipment. The built quality is great, and you get the freedom to practice with 128 tones, 80 demo songs, and 100 rhythm. To edit your master pieces, connect the flexible keyboard to a computer with MIDI cable. This is a perfect gift for children as well as adults who are trying to find their passion in music. EVERYONE GAIN fully functional roll up piano 88 keys keyboard has a compact design that can comfortably fit in a small back pack. Can be used by any age group of people who want to learn music. Easy to use, it has 88 keys with 80 demo songs, 100 rhythms and 128 tones. Comes with built-in speaker, MIDI output for easy connection to computer and volume control. 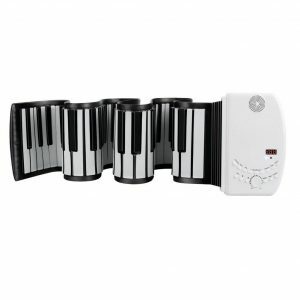 Roll out and start playing your favorite song on Aufitker roll up piano keyboard. The keyboard is made from soft silicone that is designed to emit sound just like the real piano. One can play demo song, record their own song anytime, anywhere. This flexible keyboard is light weight and runs on batteries or USB. Small and compact, the Aufitker 49 Keys Roll Up Piano works likes a real piano. Can be run on batteries or USB, this piano is for children as well as an adult who are learning to play good music. This keyboard comes with a built-in speaker, record function, playback option, volume control, echo/sustain and audio output. Practice with demo songs and then make your own master piece anywhere with Aufitker roll up piano. Lujex bring you the best roll up piano that has 88 keys for practice. This silicone made keyboard is the best gift for adult/children who want to learn piano. Supported by 1100mah built-in researchable battery, you can play music on loudspeaker or on the headset to avoid disturbing others. It also allows editing music using MIDI cable whenever you want. Lujex 88 keys piano is made from environmental silicone keyboard that is suitable for kids and adults. 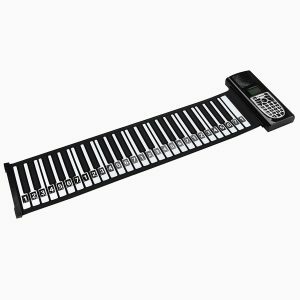 Learn your first steps of piano on this light weight roll up keyboard that run on 1100mah rechargeable battery. Hear the music on the built- in speaker or use an external headset when you don’t want to disturb others. It also has a USB MIDI output that gives you the freedom to connect it with a computer to edit any music piece. Smooth finish, light weight and easy to carry around are just a few features of this roll up piano keyboard. JouerNow RUP002 is an 88 keys piano that emits sounds and work exactly like a real piano, only this one is lighter and easy to use. The multi interface and built in speaker aids the beginners in learning music. Made from anti-bacterial Silicone rubber, JouerNow is the best roll up piano for children. The 88 keys are designed like a real piano that emits 30 demo sounds and 140 Reportoire at sound frequency 440Hz. 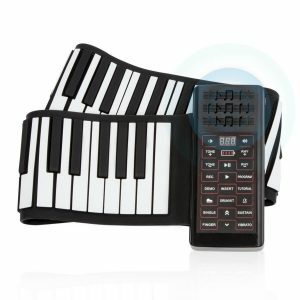 The multi-functional interface, smart design and built in speaker will surely match to the needs of portable roll up piano keyboard. It is light weight, can be stored by folding it and storing in a pouch. Convenient to use, the Andoer 88 Keys roll up piano keyboard are the best music device for beginners. With 88 keys, it works exactly like a real piano and emits high quality sound. You can record the piece, edit using tonal modification, replay and store in a computer using MIDI cable. Andoer 88 Keys portable piano keyboard can emit 140 tone, 30 demo songs and 128 type of rhythms. The digital display will help record sound, replay, give sound editing option. Hear musical piece on headphone or speaker and store it on a computer with MIDI interface. With a busy life to lead, it gets difficult to take out time to learn music. Getting tuitions for piano learning is expensive and that goes over board when you need to buy a piano on your own. 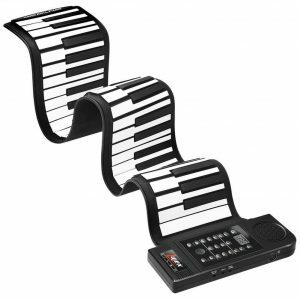 The roll up piano keyboard is easy to use, works like a real piano, pocket friendly and portable. If your kid has a knack for music, get the best roll-up piano to polish the learning abilities of your child.